AP ECET 2019 application form, ap ecet apply online : AP ECET 2019 application form has been released in the month of February 2019. Jawaharlal Nehru Technological University Anantapuram simply it says JNTU Anantapur conducts ecet entrance test for admission to 2nd year regular B.E. , B.Tech and B.Pharmacy colleges. Candidates seeking admission in 2nd year regular B.E. , B.Tech and B.Pharmacy courses may apply to this ecet 2019.Here we have to given more information about AP ECET application form 2019 through this article. 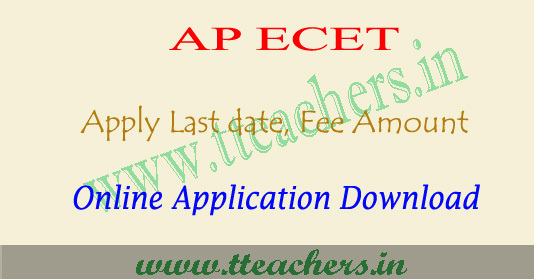 Candidates who want to apply to AP ECET 2019 can fill the ap ecet application form 2019 from March 2019. The application form available till April 2019 (upto 5:00 PM). Students can fill the application form through official website. Candidates can also visit the nearest centres for filling the online application form. Candidates can visit the nearest helpline centre along with application fee. How to apply : 1.For registration and submission of online application the aspiring candidates have to visit the web site www.sche.ap.gov.in/ecet. 2.All the details required such as qualifying examination (diploma or degree as the case may be ) hall ticket number, SSC or 10th class hall ticket number, places of study from 6th class onwards, caste categoryMee seva Cerificate number, Income certificate-Mee seva certificate number, good quality passport size photograph in .jpg or .jpeg format of 50Kb size, scanned image of Signature affixed with a black pen on a white paper in .jpg or .jpeg format of 30Kb size, Ration card of the family, Aadhar card of self in the application form shall be entered in the specified fields. 3. The Aadhar Card number of the candidate is mandatory. 4. The payment of the registration fee can be done online through AP Online services or Payment Gateway provided ( through Credit Card/Debit Card/ Net banking). Fee details : The registration fee of Rs.500/- may be paid at AP Online Centres in AP and also through payment gateway (Credit/Debit Cards/Net Banking).